You with a hope in your eyes wish that the tour never ended,by then the plane arrives and you get in.And when you do,you again spot the white washed city of Muscat in the backdrop of Mountains and sea and you know this LOVE is going to stay.With Oman I complete 10 countries,but Oman is undoubtedly the best country I have been to(many were surprised until they saw the pictures! ).It has got everything a country must have,the just perfect balance of modern and ancient.The down-to-earth all time humorous and helpful people,deserts,wadis,gorgeous coastline,envious mountains and roads and sinkholes,a country which in itself is an inspiration.For anyone who plans to settle down soon,visit Oman and you will know how beautiful the world is all over again. 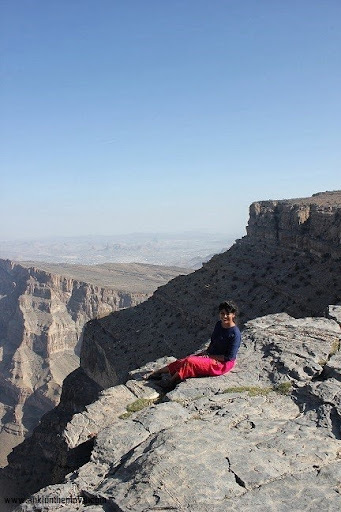 When I heard about Oman in last SATTE 2013,I could see the sparkle in the eyes of people who described it to me.But I couldn't believe a country can have so much to see,given the fact that it isn't so much known to us yet.So today,I take you to a glimpse of my la-la journey to Oman and we drool on a quick photo-essay which I had tough time selecting from because all the pictures have come out just like fairy tale. and Oman's stunning locale was the choice in "Once Upon a Time in Mumbai 2"
The song "Jiya" from Movie Gunday was shot in Al Hamra which is 40 minutes from Nizwa.Al Hamra is a village which has the oldest preserved mud houses(upto 400 years old) in Oman. Meanwhile,If you have any questions on Oman,ask and I will get back to you with information.Thanks to Oman Tourism and Zahara tours for being the perfect hosts.The process on visas,travel videos and more stories,folktales and info will be in coming posts.So we begin,shall we? 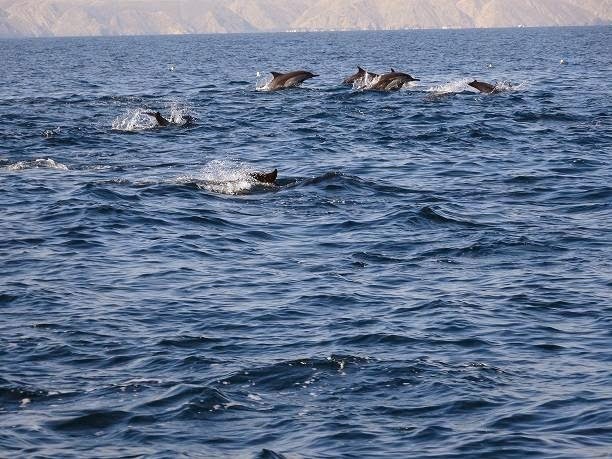 More than 100 dolphins dancing wild in the open sea. Wahiba Sand Dunes is made of Corals and Seashells,as this was under the ocean before. Unlike any other Sand Dune in the world. Gorgeous pictures all around! You look beautiful in the first picture. @Mridula:Aww Mridula,that's so sweet of you.Many thanks :) It's a beautiful place,do visit,you will love the offbeatness of it ! Such a charming photos...you seem to be lucky travelling ! As a travel buff, I am so glad to have stumbled across your blog ! I never knew Oman was such a fantastic place. The Dolphins dancing over the wide open sea look spectacular. 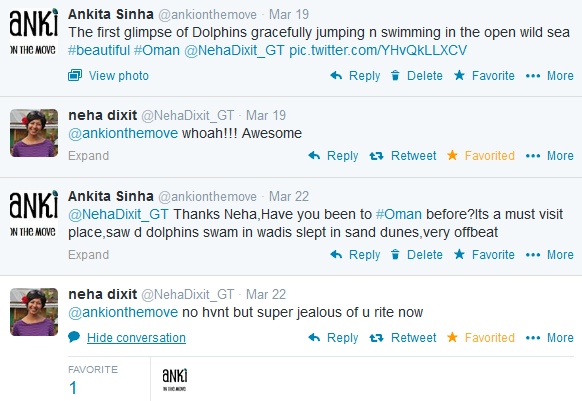 Wow Ankita! Amazing pics & you seem to be having a great time :) Lovely that you got an invitation to visit! Wonderful post. I am planning a visit there for a week in Feb and your post has now convinced me :). Which Indian travel operator did you use with Zahara Tours. I did contact Zahara and they told me to go via Cox and Kings. 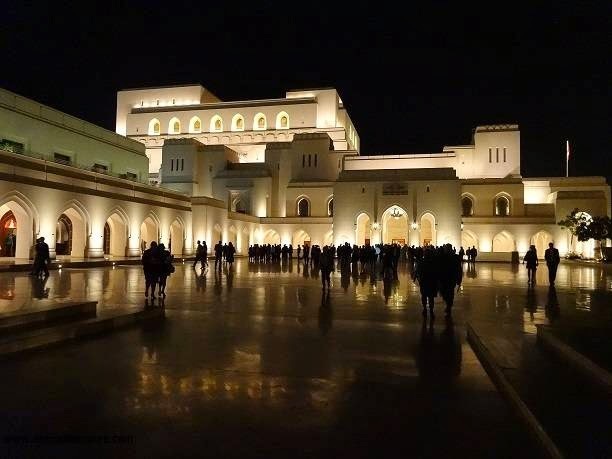 I am a bit skeptical since there arent many good reviews of Cox and kings plus their website doesnt list oman tours at all. Can you share your experience about this? I am residing in bangalore and will be going to Oman for a week followed by Dubai/Abu Dhabi and back. 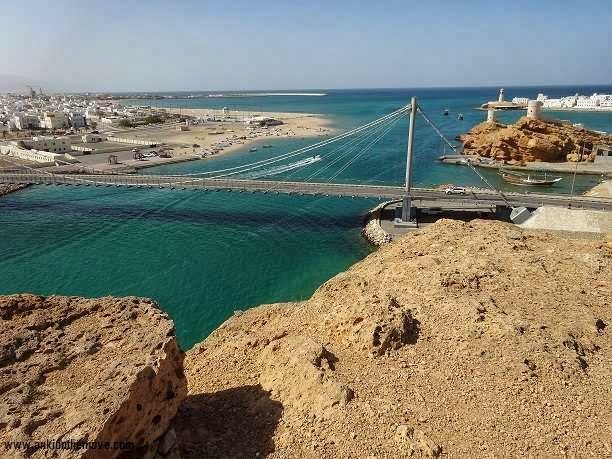 @Suraj Kamat:Oh wow thats great to know.Oman is an amazing Place.Please get in touch with arun@zaharatours.com for your request and do let me know if they get back to you.Dubai/Abu Dhabi too are different destinations but I love Oman a lot lot :) I am not sure about Cox and Kings,but may be they are in collaboration with Zahara and hence the confusion.